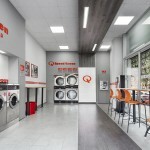 The new Barcelona (flagship) store, the first in Spain, combines with excellence the traditional idea of laundromat, with new concepts created with the user’s comfort in mind. 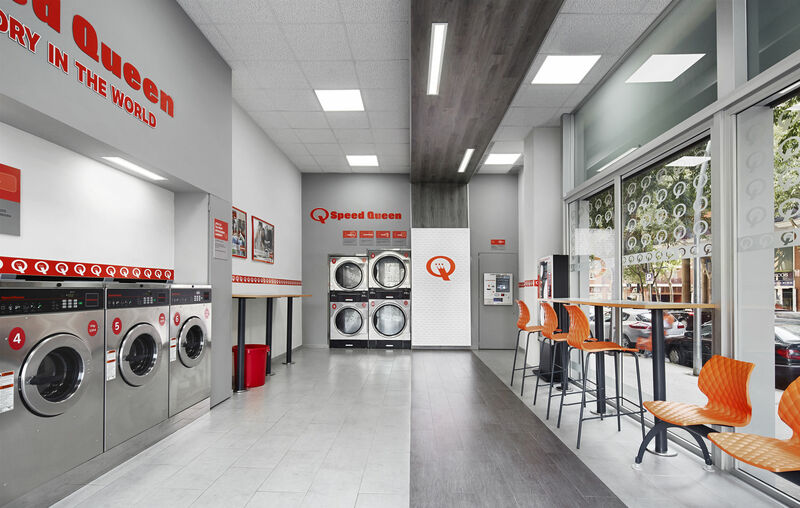 A 2-floor store with a complete laundromat on the ground floor, and a mezzanine that introduces a relaxing area, isolated from the rest and designed to comfort and build the best experience in a laundromat, in a natural light environment. Relax on our sofas, surf the internet with free WiFi, enjoy TV and music and discover the new activities to immerse yourself in a new dimension you will not want to leave. A new redefined luxury laundromat experience designed to create the most comfortable laundromat, where you will forget about your laundry. Madrid (flagship) store brings the classical Speed Queen concept to its best. A big store, an open space, comfort for the user while waiting for the laundry to finish. A full pleasure enjoying entertainment from TV and music, while surfing the net through free WiFi, all in a natural light ambiance to pack an experience that has never been felt before in a laundromat. A luxury environment built specifically to create a new and unique link between user and service, to change the perception of the laundromat, to look forward to this time of the week.